Here we take a look at some of the best DIY small kitchen ideas for getting the most out of a smaller space. Dealing with kitchen clutter is an everyday task for a lot of us. 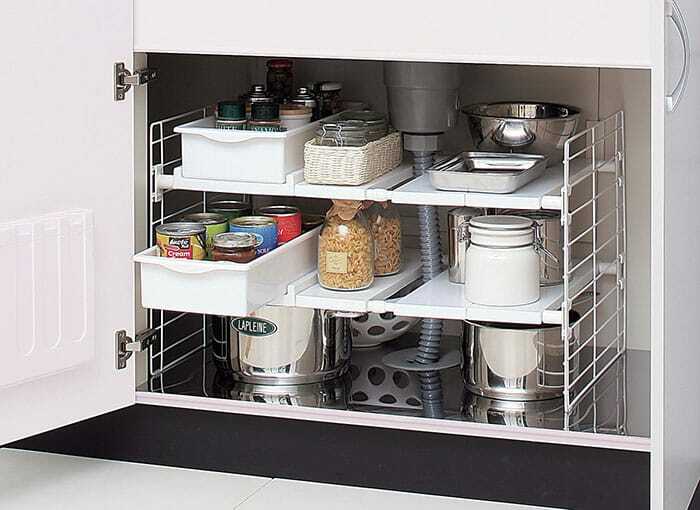 It’s a tough place to keep clean and tidy, especially if it’s small and lacks enough space to accommodate all your kitchen wares. But for every kitchen problem there is a DIY solution. From an overflowing cabinet to an untidy kitchen counter top, tackling small kitchen issues is no more a long lasting trouble. Quick and easy kitchen fixes are all you need to make your small kitchen look extremely neat and tidy. So take a look around in your kitchen and let your creative juices flow, because you are about to change the way your kitchen looks quickly and without a lot of cost. 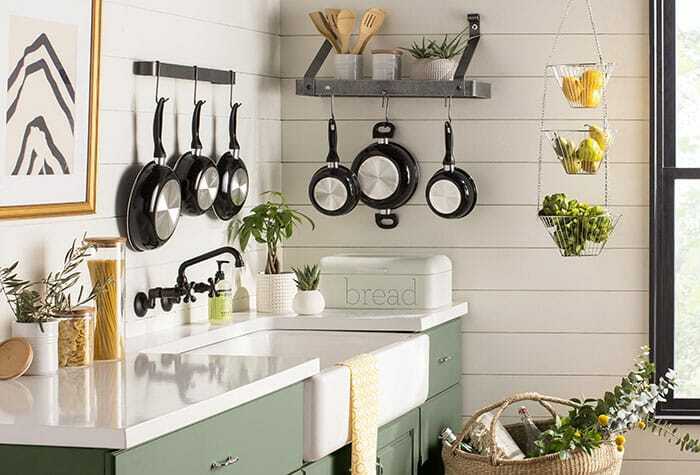 Read through our curated lists of fun and interesting kitchen DIY projects to make your small kitchen much more efficient and organized. 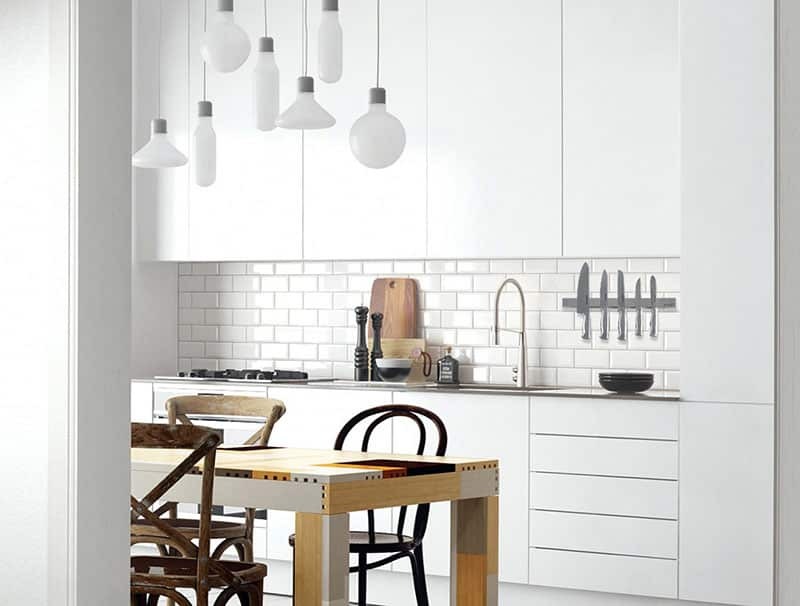 From bringing in some extra space to enhancing the look of your small kitchen, here are smart kitchen DIY ideas to bring in some big changes to your small kitchen. This is one of the quickest and the most easiest DIY’s that you can begin with, in your kitchen. A broad cutting board can be placed over the sink area to save space and make cutting much more convenient and hassle free. Placing cutting boards over the sink is not just space saving but also helps in keeping your kitchen top fuss free while you are cutting your veggies. All you need to make sure is that the cutting board’s length and breadth matches that of the sink, so that it holds it properly. 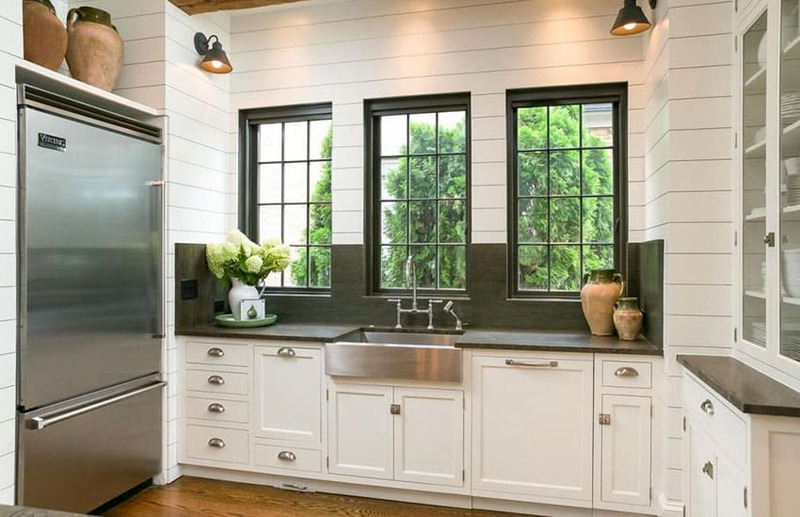 The kitchen shown her has a dual basin farmhouse sink with two wood cutting boards to create an effective food prep station. Having two different cutting boards is useful to avoid cross contamination of different foods that may not require further cooking. 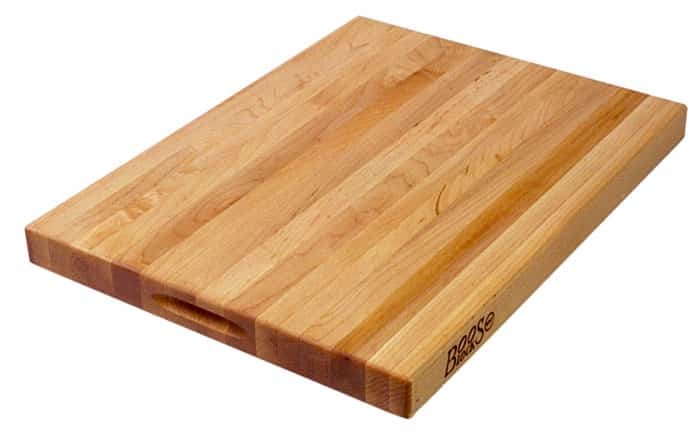 A wood cutting board can provide a stable surface for food preparation. Some models such as the one shown here can be used on both sides for situation when you want to use one side for meat or poultry and the other side for fruit or vegetables. When using meat products a wood cutting board should be made of hard woods such as maple which are fine grained and less likely to store harmful bacteria. 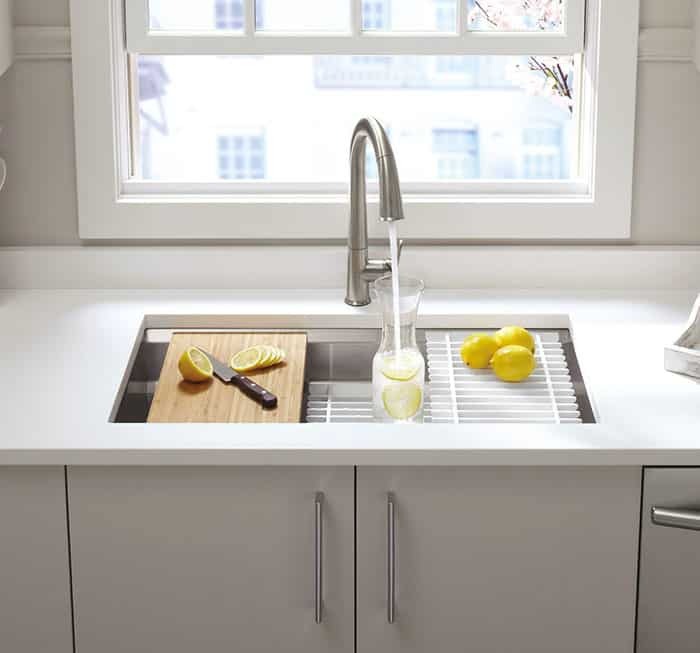 An under mount kitchen sink with cutting board and accessories built in can be a space saver. The sink shown here has three built-in ledges inside the basin. 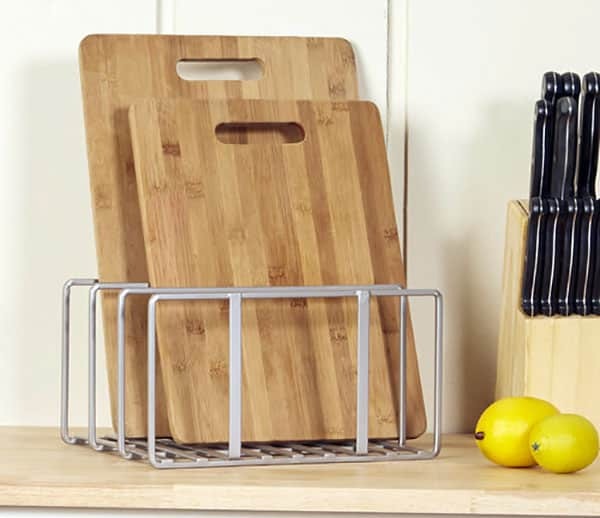 The graduated ledge design allows one to place multipurpose grated racks, a colander or cutting board exactly where you want for maximum efficiency. 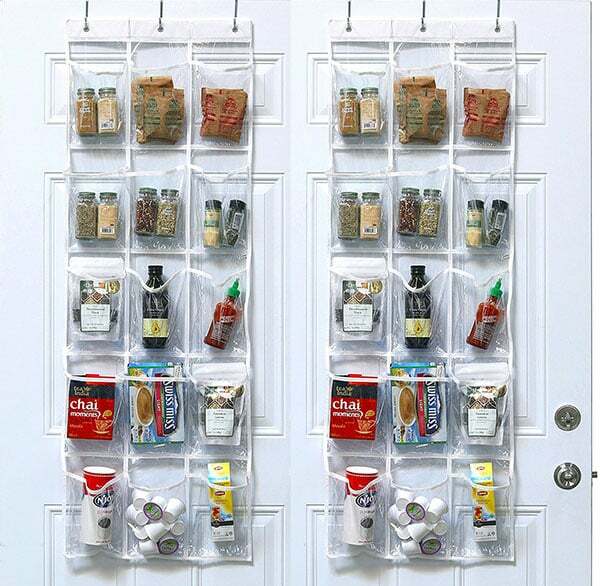 Pocket organizers can be really helpful in a small kitchen. This DIY idea using a pocket organizer is quick and simple, yet gives you maximum results. Attach a pocket organizer inside your cabinet door to make use of the door space. Make sure its size fits the size of the door so that it gets neatly attached in the available area. 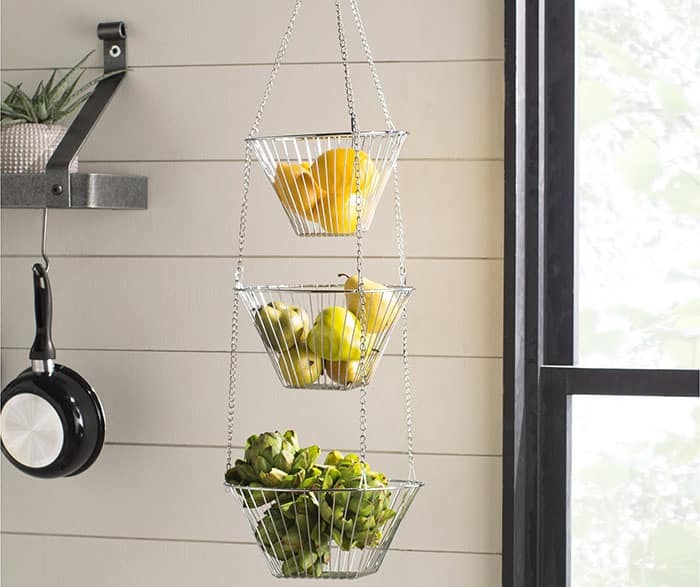 From keeping kitchen dishes, tin cans or to organizing cutlery, pocket organizers can be quite useful in making optimum use of your small kitchen area. When kitchen cabinets and shelves are already loaded with essentials, its time to look at other storage option. And what else is better than using the vertical space on a kitchen wall. Hanging baskets on the wall is a kitchen DIY that you can undertake to store everything from cans and food packets to fruit and vegetables. They are easy to fix and can hold quite a lot of your often-used veggies like onions and potatoes while also accommodating food cans and packages. 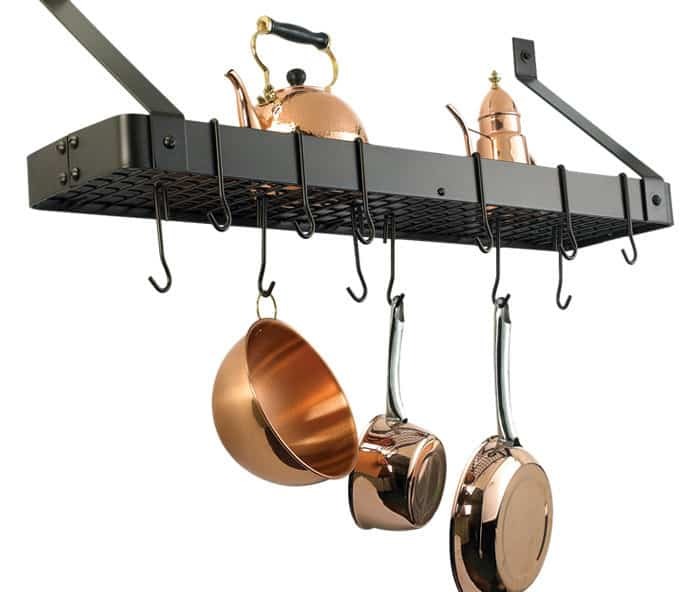 A hanging or wall mounted pot rack can help clear out needed cabinet space and allow you easy access to your pots and pans while preparing food. Many models offer additional shelving space for storing tea pots, coffee press or other kitchen items. 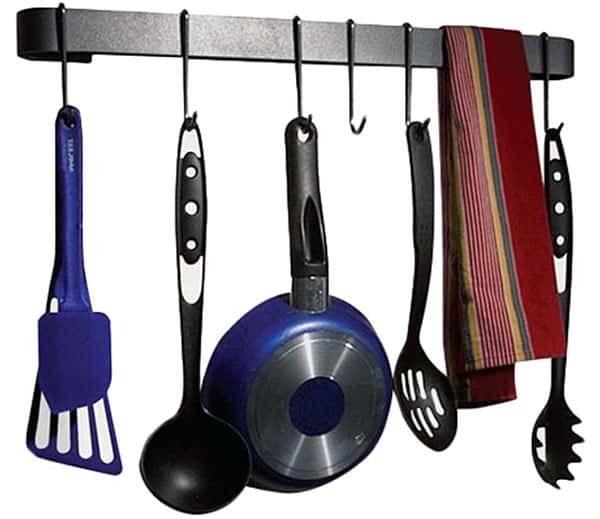 Wall mounted pot racks can also be used for storing utensils to free up cabinet and drawer space. For those who enjoy a nice bottle of wine but would like to avoid all the room bottles take up a wall mounted wine rack may be an ideal solution. 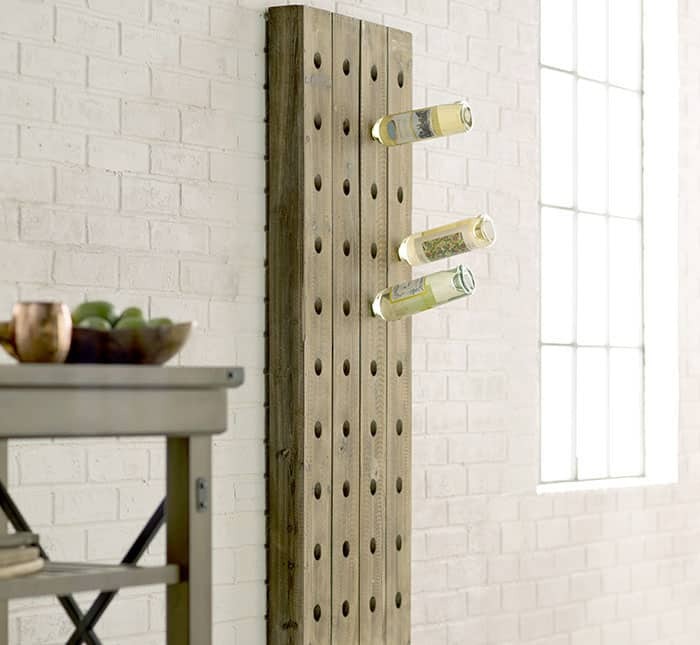 Wine racks come in a wide range of styles and materials. Choose one that matches your kitchen’s design, and you own personal taste. Just when you are thinking there is no way to stack your bake wares, here is a smart DIY idea to save some kitchen space. If you thought file racks were only meant to organize files in your workspace, then you are mistaken. Place them on your kitchen top or in your cabinet to hold your bake wares and cutting boards neatly. Keeping them in a filing rack helps you use it and place it back easily without seeing them lying around in your kitchen. Pegboard is a fun resource for organizing things creatively. We often see them in study rooms and office spaces, but let’s go a bit further and get them introduced into our kitchens. If you have an empty wall, fix a pegboard and attach hooks to hold your coffee mugs and cups. This will save space in your cabinets and drawers. 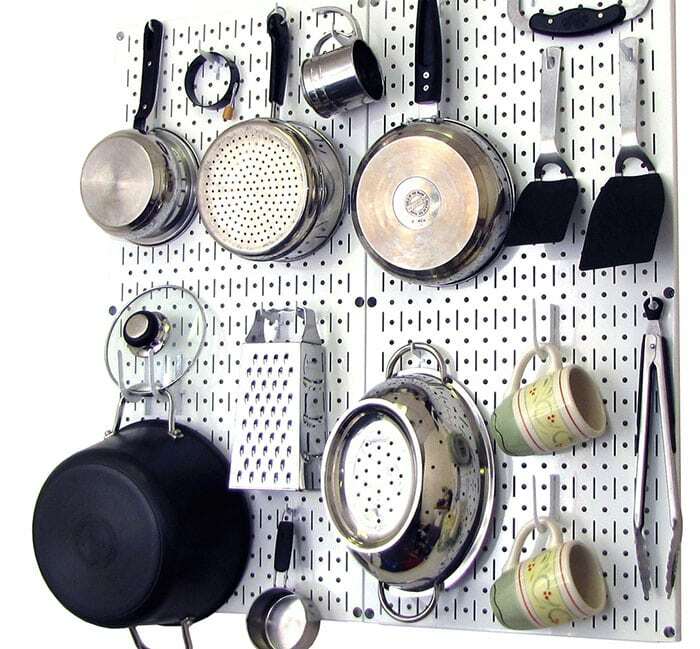 Also, if the pegboard is large enough, it could hold your pans and woks along with other kitchen wares like spoon, peelers, graters and more to keep all your essentials organized and handy. To make it look pretty, pick a colored pegboard that suits your kitchen décor. Having enough shelves in your kitchen is always a good idea to store away your things. 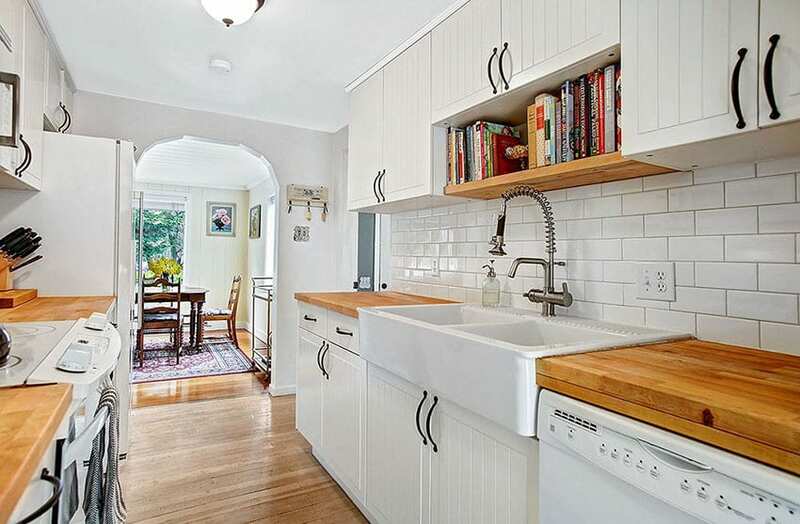 Not everyone has the luxury of having a large kitchen space with walls holding elaborate shelves. But that doesn’t mean you cannot do some smart DIY tasks in getting shelf space even in your small kitchen. Place a wired shelf against a kitchen wall to get some extra storage space in your kitchen. 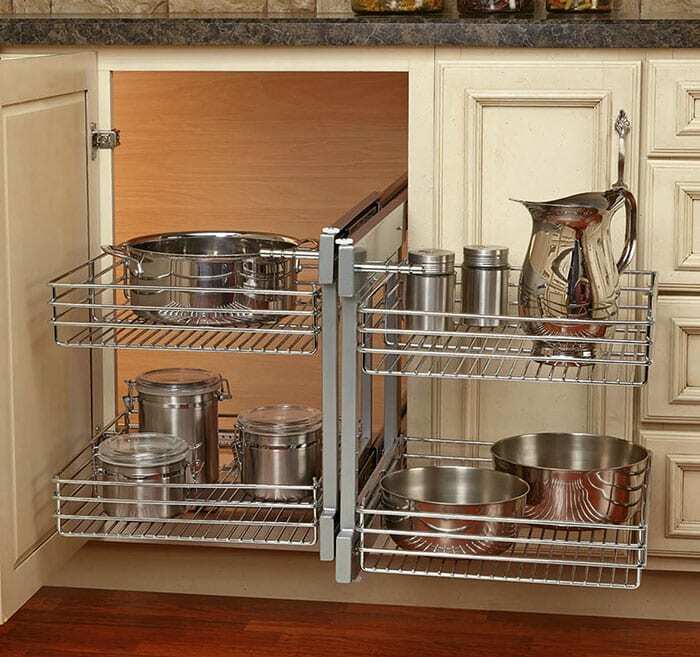 This works especially great for kitchens that cannot accommodate drawers and cabinets. A wired shelving range can be divided to hold all your kitchen essentials from food packages, spices and herbs to even kitchen wares. Being the perfect alternative for cabinets, this DIY idea is surely going to get your tiny kitchen a lot more organized. 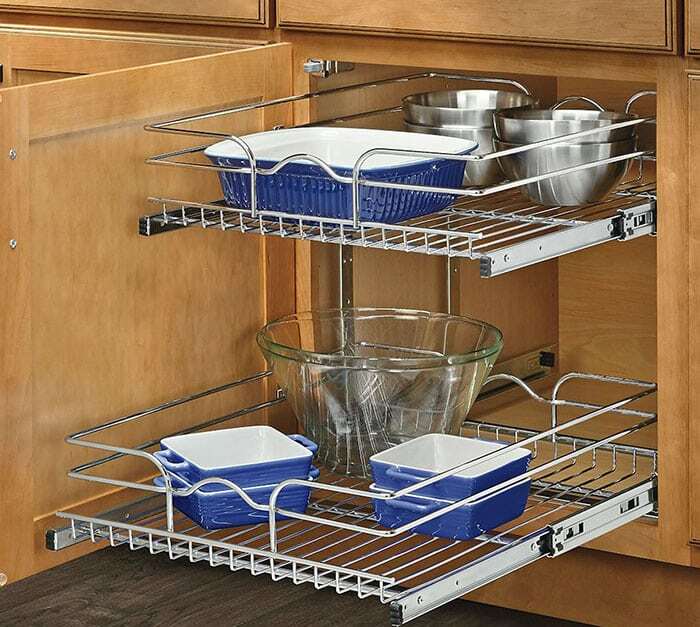 Placing wire shelving inside a kitchen cabinet can be another way to better utilize your available space. For those hard to reach corner kitchen cabinets many people choose to install a lazy Susan or other type of corner organizer to maximize space. A spot that usually has a lot of disarray in under the sink. Adding a storage organizer to sort all of the containers, can goods, soaps, chemicals and disinfectants can help get things under control and looking more appealing. 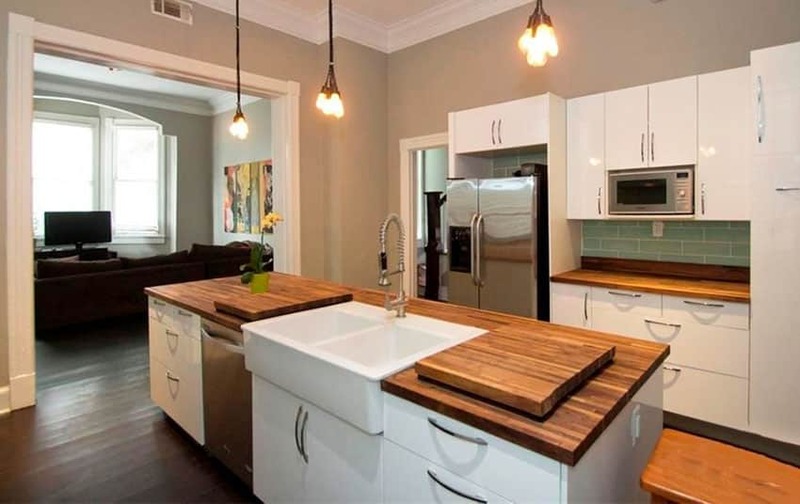 If you are dealing with a small kitchen then chances are that you do not have enough counter space or cabinet space. This DIY idea for small kitchen is being loved for its quick and easy set up that keeps all your knives organized at an arms distance. Fix a magnetic knife strip on your kitchen wall, above your kitchen counter to keep your entire knife collection organized at a place. A magnetic knife holder uses the vertical space on the wall ensuring you have much less clutter in your kitchen while assembling all the knives together. 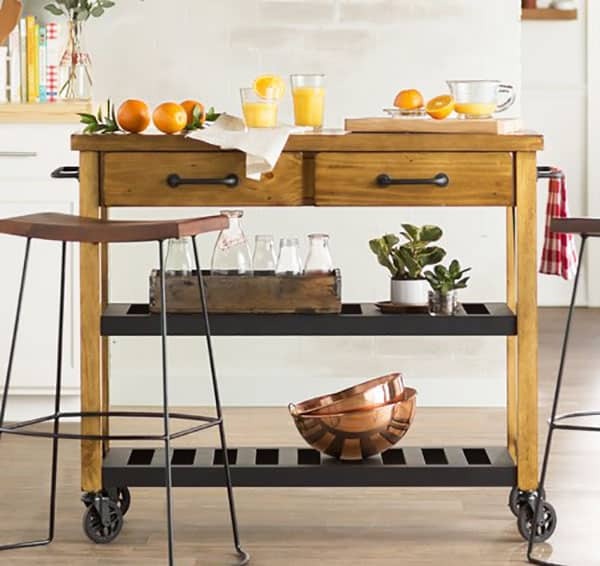 An effective way to add a little extra space for storage or to use for meal preparation is through the use of a portable kitchen cart. These come in a wide variety of styles and finishes to match practically any type of kitchen design. A movable kitchen cart can be positioned where you want and used as additional counter space when needed. You can see more portable kitchen island ideas on our gallery page. Since no amount of storage is ever enough, here is another fascinating DIY idea for small kitchens that you can implement. If you do not have space for drawers and under the counter cabinets then using the wall cabinets to its maximum capability is the right thing to do. While there have been ideas related to attaching pocket organizers inside the cabinet door shared with you already, here is another DIY idea you can undertake to get some extra space around your wall cabinets. 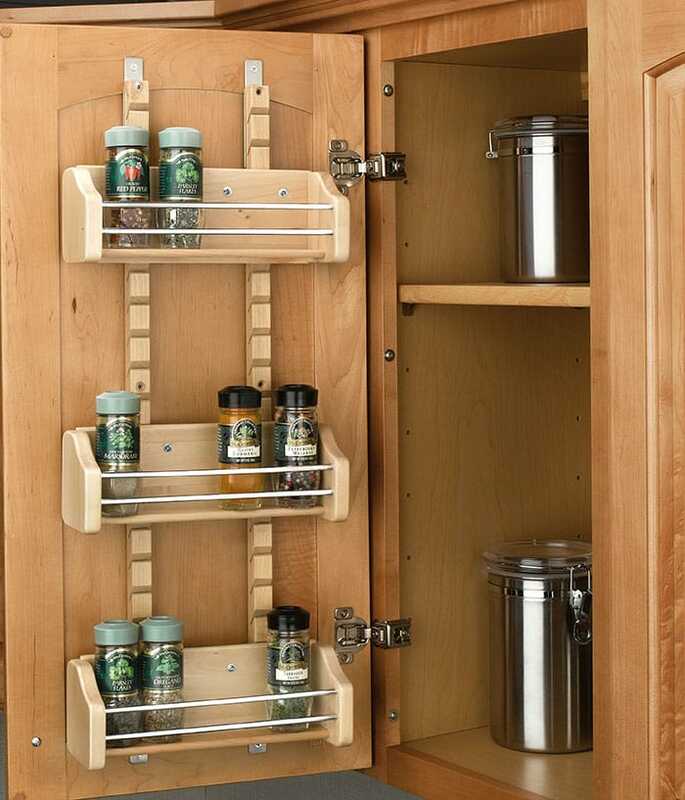 Attach shelves on the sides of the cabinet where you can easily place your cans of spices, sauces or other essential that you use on a regular basis. Make sure that the side shelves are attached according to the required height and width to accommodate tins and cans. DIY small kitchen ideas don’t have to be complicated. A small shelf over the sink or attached to an open wall can provide extra space for kitchen cookbooks or other items you frequently use. We hope you enjoyed our DIY small kitchen ideas. For those looking for tips on how to organize a small kitchen you can read more here.